Tiny houses under construction in August in Emerald Village. Michael Fifield’s design is at center. Gillem, an architecture professor in the School of Architecture & Environment and principal of the Urban Collaborative design and planning firm, is one of 14 architects—many associated with the School of Architecture & Environment in the College of Design—who responded to a request to design and build 22 houses for the new Emerald Village tiny home complex in northwest Eugene. Gillem and Fifield both teach in the Department of Architecture in the School of Architecture & Environment. The idea for the 22 tiny-house complex was sparked after Rev. Dan Bryant of the First Christian Church in Eugene learned that a member of his congregation, Dan Hill, BArch ’80 and senior principal of Arbor South Architecture, leads high school students on a trip every year to Mexico to build houses for homeless residents. After Bryant took part in the Mexico project, he spearheaded SquareOne Villages, a non-profit organization dedicated to creating communities of tiny homes for people needing housing in Eugene. 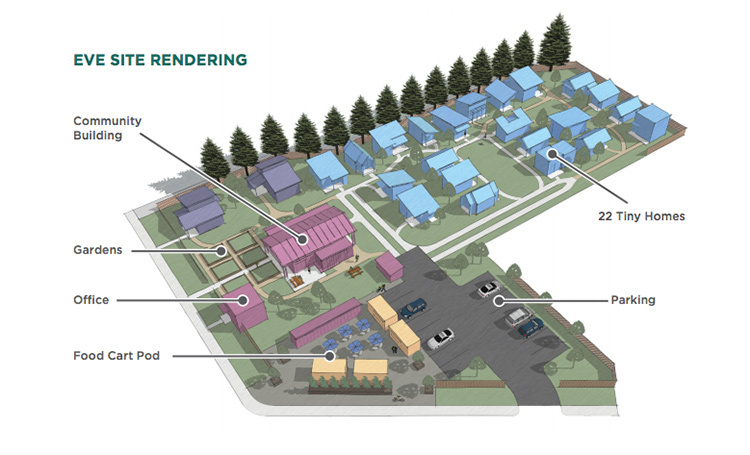 Under the rubric of SquareOne, Emerald Village is providing tiny houses that are safe, affordable and sustainable. Each has sleeping and living areas, a kitchenette and bathroom—with plumbing, electricity and heating—tucked into custom house designs ranging from 160 to 300 square feet. The challenge to architects was to design a house that could be built with $15,000 in materials and $10,000 in labor, all of which would be donated, while meeting all building codes. 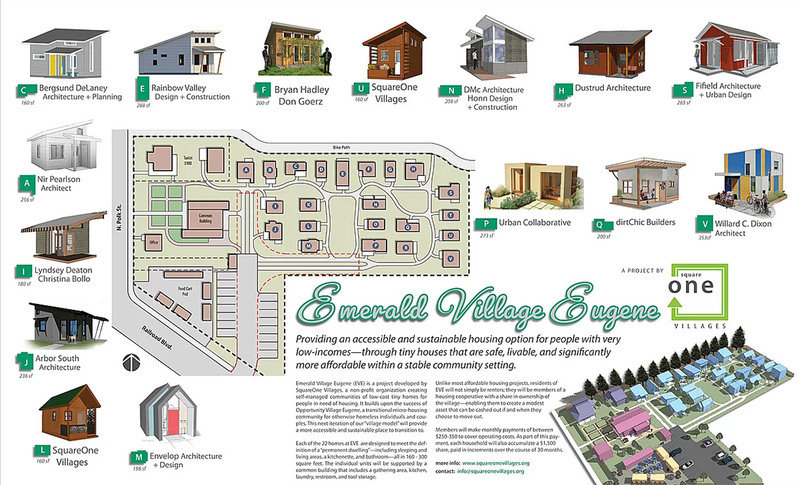 Emerald Village Eugene site plan. 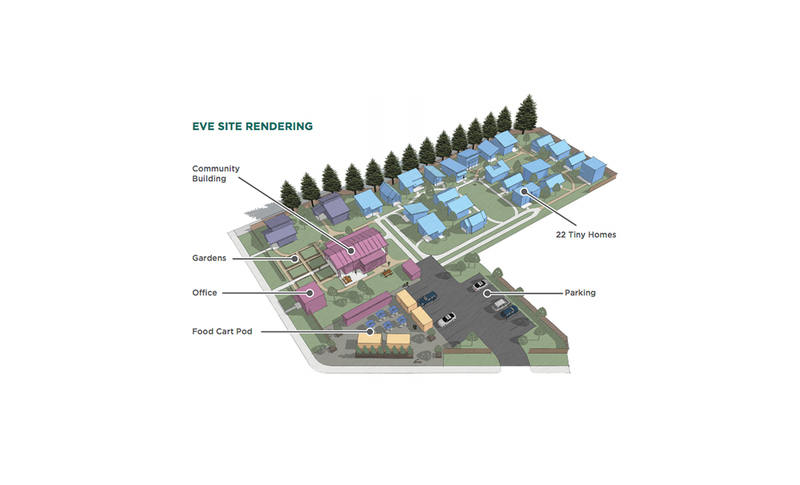 The Emerald Village site will include individual tiny homes as well as support buildings. Fifield’s tiny house design for Emerald Village won the Un-built category in the 2015 AIA Southwest Oregon People’s Choice Awards Program. It also received the Mayor’s Choice Award. Several other College of Design alumni and current students also contributed to building tiny homes. 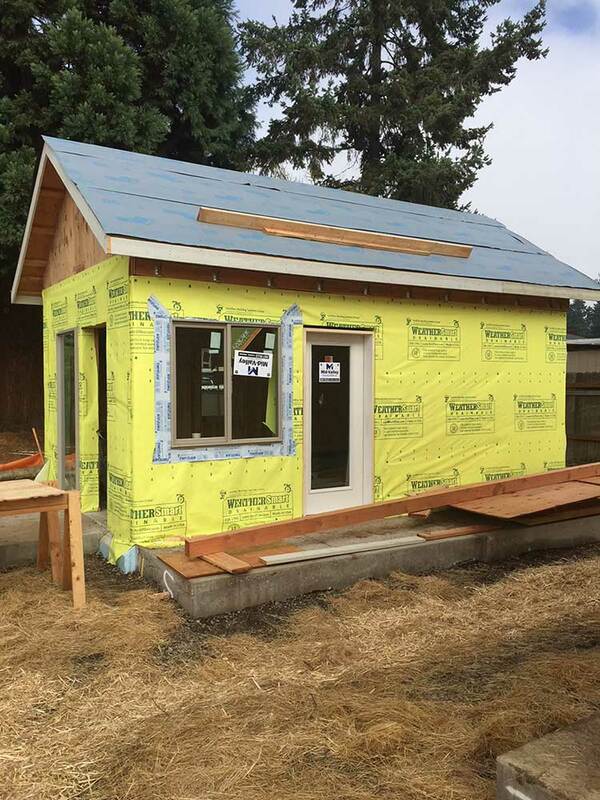 Bryan Hadley, MArch, ’16, teamed up with current UO architecture graduate student Don Goerz on one tiny house. Lyndsey Deaton, a current architecture PhD student, partnered with Christina Bollo, MArch ’02, PhD ’15 and a UO instructor on another. Other College of Design graduates contributing to Emerald Village include Nir Pearlson, BArch, ’95, and Paul Dustrud, BArch, ’98. Emerald Village is a housing cooperative, so part of each resident’s monthly rent accrues in an ownership share of up to $1,500 that can be cashed out if they choose to move out. Rents are $250-350 per month including utilities. Community members also contribute 10 hours a month of labor to village operations. The architects who donated their time, materials, and labor to the project have a history of collaboration in the Eugene architecture community. Fifield and Hill are speakers at a workshop on October 22 to encourage homeowners to build tiny houses in their back yards. Each house aims to be energy-efficient as well as efficient in space use. This design is by Michael Fifield, an architecture professor at UO and principal of Fifield Architecture + Urban Design, a Eugene firm that specialists in small dwelling units. 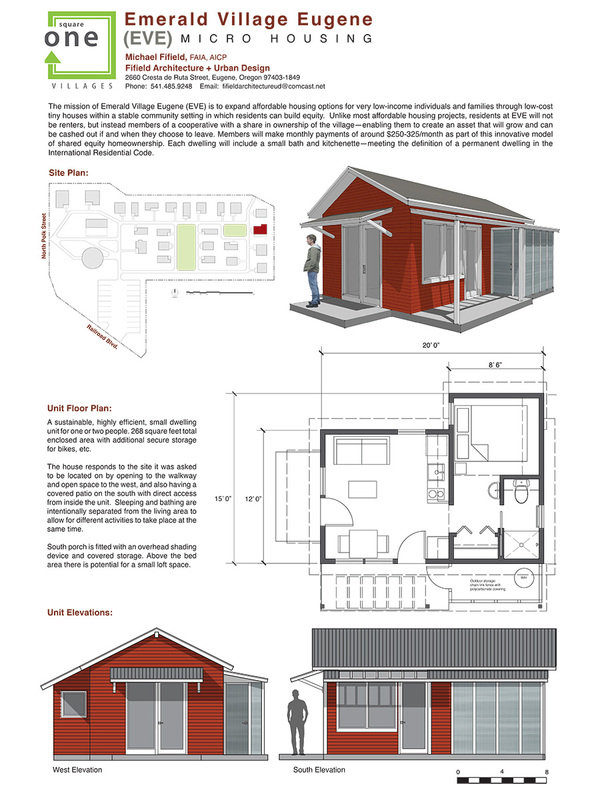 Fifield’s tiny house design for Emerald Village won the Un-built category in the 2015 AIA Southwest Oregon People’s Choice Awards Program. It also received the Mayor’s Choice Award. Fifield’s house with windows installed moves nearer to completion on its Emerald Village site.